Red Ruffing's journey from a horrific injury as a youth to becoming a Hall of Fame pitcher is one of incredible obstacles and struggle, yet, he was able to overcome them all through hard work and determination. This top list highlights the finest Red Ruffing baseball cards appearances from his illustrious career. Shop for Professionally Graded Red Ruffing Cards on eBay. As a youth, Ruffing was in a mining accident in which he lost four toes on his left foot, ending his budding career as an outfielder. As he wasn't able to run any longer, he tried a switch to pitching and found success. He eventually signed with the Boston Red Sox and debuted in 1924. To say that Red Ruffing struggled while with the Red Sox would be an understatement. He twice led the league in losses and had an overall record of 39-93 as of 1930. He was then traded to the New York Yankees in a swap that would prove to be nearly as one-sided as their trade of Babe Ruth. 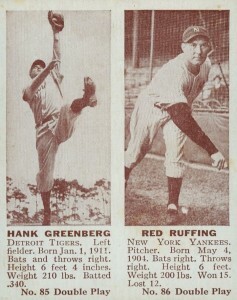 Almost immediately upon joining the Yankees, Ruffing became one of the best pitchers in baseball. 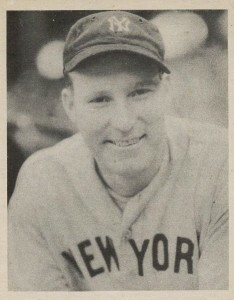 He was selected to six All-Star teams with New York and won 20+ games a year between 1936 and 1939. Ruffing really shined in the World Series, earning a 7-2 record over his nine series starts. He was also a perfect 4-0 when selected as the Game 1 starter. Although his career progressed slowly, Ruffing was 231-124 with the Yankees, good enough to be selected to the Hall of Fame in 1967. Fans looking for Red Ruffing cards from his Red Sox days have a few options available. In addition to an Exhibits photo card from 1925, there is a 1991 Sporting News Conlon set with several black-and-white cards featuring Ruffing from his time in Boston. He also briefly pitched for the Chicago White Sox at the end of his career and that is noted in the 1961 Fleer Baseball Greats set. 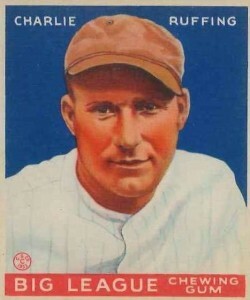 Although Ruffing was a key component of the New York Yankees' dominance in the 1930s, his trading cards are sometimes overlooked in favor of some of his other Yankee teammates. In constructing his top list, a focus was placed on building a comprehensive collection with inclusions for collectors at all budget levels. A great place to start a Red Ruffing collection if you are on a limited budget would be the 1960 Fleer Baseball Greats set. The 78-card set has super stars of yesteryear plus one of the last cards of Ted Williams from his playing days. The cards come in a variety of border colors and Ruffing's orange/red border surrounds a nice close-up photograph of the Yankee pitcher. The initial set produced by Michael Pressner and Company was issued in 1943 and has the distinction as being one of the few baseball card sets distributed during World War II. These cards — including Ruffing's — were sold in strips that needed to be separated and so they are often found today in poor condition. There was also a second set that was produced in 1949 with a similar style. Throughout most of the 1930s, Wheaties Cereal offered card collectors many different configurations of trading cards that could be clipped from their cereal boxes. 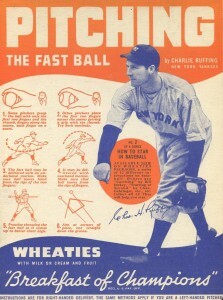 Some series where similar to over-sized photo cards (1936 Wheaties Series 3) while others where more like posters, such as the 1937 Series 6 that included Ruffing. His appealing card teaches you how to throw a fastball, from finger placement to the correct pitching motion. 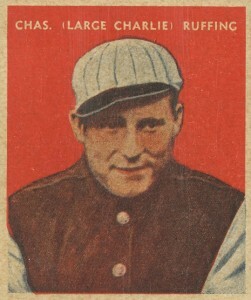 The jacket Ruffing is wearing on his 1933 U.S. Caramel card is certainly unique but his pinstripe hat gives him away as a Yankee. 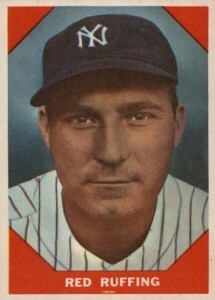 As the Yankees were the dominant team at the time, many players from the set's 32 cards were also from the Bronx Bombers. 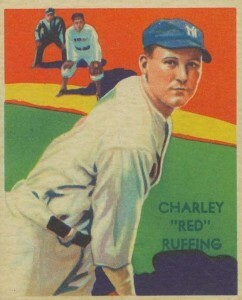 Ruffing was famous for his nickname of "Red," however, the U.S. Caramel set features a lesser known nickname of "Large Charlie" on the front of his card. While the 1940 Play Ball set has quality black-and-white photography, the company took many of those same photographs and added a color painting over the top for the 1941 Play Ball set. This was the case for Ruffing's cards in the two sets and, as they are so similar, collectors can pick up the one that speaks to their personal preference (for me, it is the 1940 version). Red Ruffing shares his 1935 Goudey card with Hall of Fame teammate Bill Dickey. Dickey was Ruffing's counterpart behind the plate and no doubt was partially responsible for Red's success. 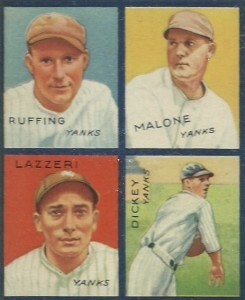 Along with Ruffing and Dickey, fellow Yankees pitcher Pat Malone and Hall of Fame infielder Tony Lazzeri are also featured on the blue-bordered card. 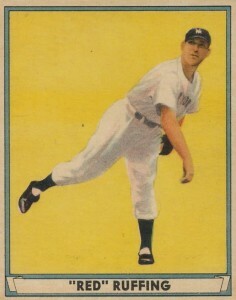 Ruffing sits early on the checklist of the groundbreaking 1939 Play Ball set and as one of the best pitchers in baseball at the time, his card was one of the most popular at the set's release. Issued over the course of the year, there were typographical changes on many of the cards and you can find Ruffing's cards with his full name in all capital letters on the reverse as well as standard lettering. Besides being a beautiful and colorful painted card, Ruffing's 1934-1936 Diamond Stars card is one of the few that features an umpire that isn't working home plate. Instead we have the second baseman (who would probably have been Tony Lazzeri on the 1935 Yankees) and the second base umpire behind him looking on at the action. 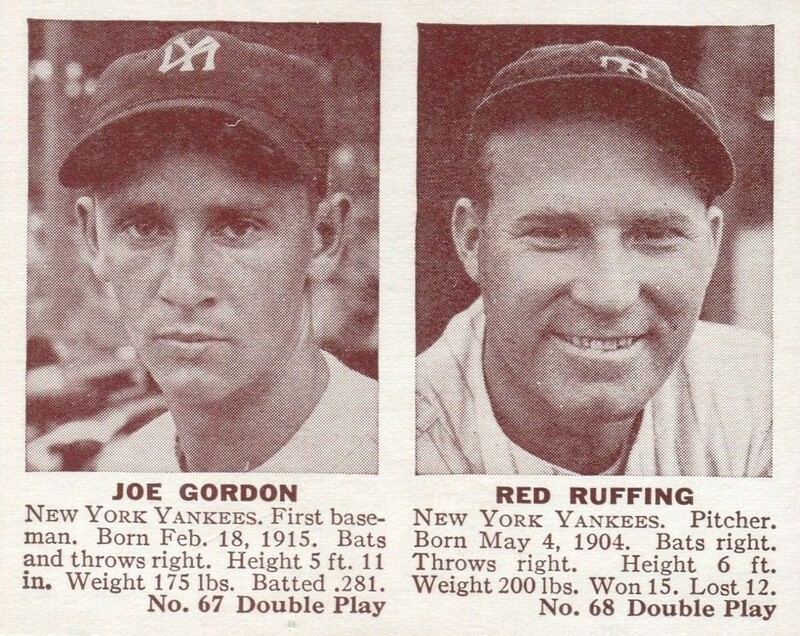 Red Ruffing is included on two separate cards in the 1941 Double Play set, including one with teammate Joe Gordon and one with Detroit Tigers rival Hank Greenberg. Sometimes the Double Play set would combine two future Hall of Famers together on one card and, in Ruffing's case, he was paired with future Cooperstown members on both cards. Greenberg was elected to the Hall in 1956 and Gordon was selected by the Veteran's Committee in 2009. 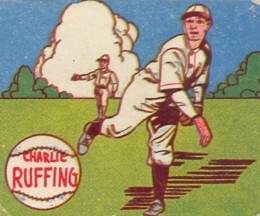 One of Ruffing's most popular card is certainly his appearance in 1933 Goudey. 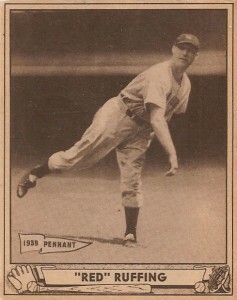 Given the Yankee pitcher's popularity and the tendency for Goudey to re-use the same art from set to set, it is surprising that he was not also included in the 1934 Goudey set. Collectors can pick up well-graded versions at auction for about $300. 1941 Double Play #85 Hank Greenberg & #86 Red Ruffing, Ex - Mint Condition! 1939 PLAYBALL # 3 RED RUFFING (HALL OF FAME) !! Are u intetested to buy them?? ?